A Former Lord Mayor: Sir Mark Rainsford | Come Here To Me! Recently, I asked a group of friends if they could name the Lord Mayor of Dublin. Most couldn’t. While the office today doesn’t inspire or hold much of a public role in the city, historically some interesting characters have held the honour. Over the next while, we’re going to profile a few of them on the site, beginning with Mark Rainsford. Sir Mark Rainsford was Lord Mayor of Dublin from 1700 to 1701, and to me remains one of the most interesting individuals to have held the office. Rainsford was the 36th Lord Mayor of Dublin. During this period the statue of King William of Orange on College Green was unveiled by him, a monument which would become a centre of protest and celebration for generations in the capital. Rainsford was also the original founder of the brewery at St. James’ Gate, which would later become the Guinness Brewery. Rainsford Street, next to the brewery today, is named in his honour. From Guinness’s Brewery in the Irish Economy 1759-1876 (Cambridge, 1960), we know that the premises at St. James’ Gate which is today the celebrated Guinness Brewery was owned in 1670 by Alderman Giles Mee, who himself went on to become Lord Mayor of Dublin. On his passing, the brewery was giving to his son in law, Alderman Sir Mark Rainsford, who also inherited certain water rights in the district. Rainsford thus began brewing “beer and fine ales” in the brewery, being succeeded in this position by his son of the same name at the time of his own death. The younger Mark would lease the premises out for a term of ninety-nine years, but it did come back into the ownership and management of the Rainsford’s in 1750, 9 years before Arthur Guinness would take ownership of the site. The Rainsford’s leased the brewery to Guinness for a sum of £100, and £45 a year thereafter. The lease would run for an incredible nine thousand years! In 1700, Sir Mark Rainsford became the Lord Mayor of Dublin, following in the footsteps of Sir Anthony Piercy. Rainsford had previously held the office of Sheriff. During his year as Lord Mayor, Rainsford would oversee the unveiling of the statue of King William of Orange on College Green. Grinling Gibbon’s statue became a magnet for both protests of dissent and commemorations of loyalty to the divisive figure. On the anniversary of King William’s victory at the Battle of the Boyle, and on his birthday in November, this statue was the location of celebrations in his honour. The statue would be cleaned, with orange lilies and ribbons placed upon it, and symbolically green ribbons and Shamrock would be placed below the horses uplifted foot (See: The Book of Days: A Miscellany of Popular Antiquities: Volume 2 London,1869). No statue in Dublin was as frequently targeted by vandals and political opponents as this one. In one episode in June 1710, the statue was robbed of its regal sword and martial baton, which led to the Corporation offering a huge reward of £100 for information which could catch the guilty party. Three students of Trinity College Dublin were charged with the act, and condemned to a harsh six months imprisonment, a fine of £100 each and forced to stand before the statue bearing the slogan “I stand here for defacing the statue of our glorious deliverer, the late King William.” Their fines were significantly reduced in the end, though the lads were expelled from Trinity College. The statue was removed from the Dublin streetscape following a bombing following independence, something we’ll be returning to on the site later. 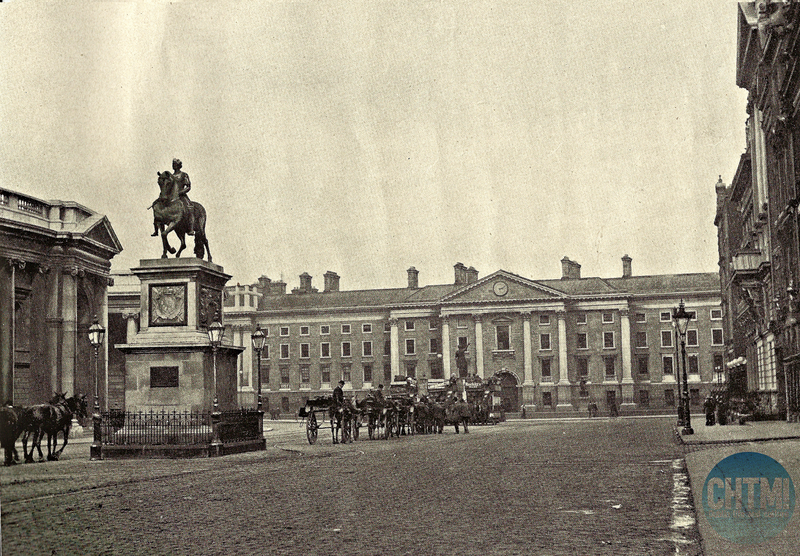 This equestrian statue of William III stands in College Green, and has stood there, more or less, since A.D 1701. We say “more or less” because no statue in the world, perhaps, has been subject to so many vicissitudes. It has been insulted, mutilated and blown up so many times, that the original figure, never particularly graceful, is now a battered wreck, pieced and patched together, like an old, worn out garment. The great occasion around the unveiling of the statue was the highlight of Rainsford’s year as Lord Mayor. In his personal life, he married twice, first to the daughter of Giles Mee, from whom we acquired the St.James’ Gate Brewery. He would marry for a second time in 1695 at St.Michan’s in Dublin, to a woman named Isabella Bolton. 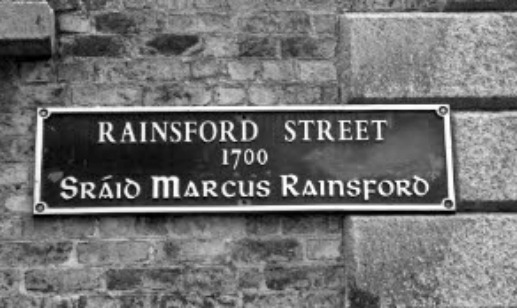 The role of the Rainsford family in Dublin history and brewing history is evident today in the naming of ‘Rainsford Street’, next to the Guinness Brewery. 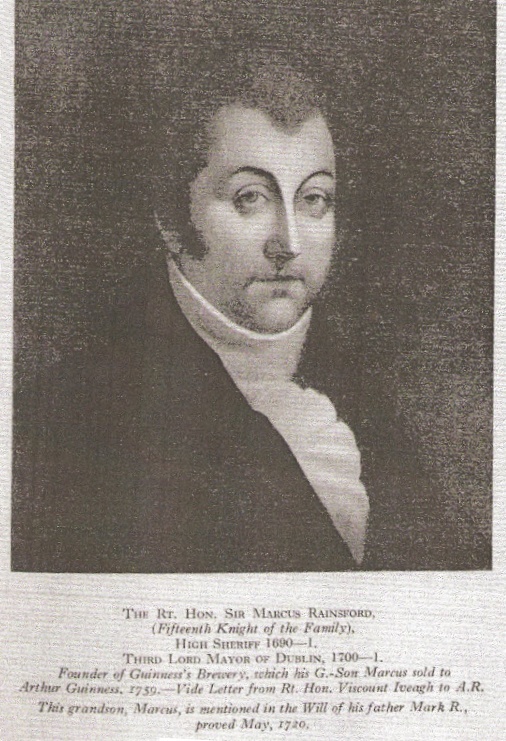 Rainsford was followed by Samuel Walton, who became the 37th Lord Mayor. Rainsford passed away in November 1709, aged 57. Rainsford was also something of a property developer. One of his developments Belle Vue was more or less where the brewery is today. In fact, if you look very carefully at a building on Rainsford Street you’ll see some surviving late 17th century brickwork which was left in situ after the building was refacaded sometime in the early 19th. The Belleview name was carried on after Guinness took over: the initial matling house was called Belleview and after it closed down and the business was transferred to Islandbridge, the name was taken with it. Great read 😉 any more information on Mark Rainsford would be greatly appreciated. I’m keen on learning anything about Marcus Rainsford and the sale of the brewery. How are you related to Sir Rainsford? Only saw this now, interesting! Sir Mark was the brother of my great, great, great, great, great, great, great Grandfather. It looks lie were all related somewhere along the line, my grandmother was a rainsford. “Alderman Giles Mee, who himself went on to become Lord Mayor of Dublin.” No, he didn’t. Lynch & Vaizey, in their otherwise excellent book on the early history of Guinness, get this wrong, and others have repeated it without checking.